This whole week, I have been so in love with spring and green grass and shiny sun and kids playing outside. I am never going to take these for granted again. After seeing tons of snow and brown grass for two weeks in Canada, coming home to Virginia was like going to the Caribbean for vacation during a most brutal winter. Of course, winter here also involved some (almost nothing) snow and plenty of brown grass, but it's something entirely after seeing the worst of it and coming back home to see everything with fresh eyes. Also, spring did arrive while I was away. At this point, I am tired of how much I have been talking about my Canada visit. I have spent a good chunk of this week talking about it with co-workers and some friends, plus I have over-mentioned it on this blog as well. So if you are fed up as well, I totally understand. But you will can humor me for one more post right? Just one teensy post? There were some wonderful highlights from the trip that I want to mention - a lot of it for my record but hopefully for your entertainment too. And plus, plenty of photos! We stayed in Toronto for about 10 days. It always amazes me when I can go to the next country in less the time it takes me to go to many places in this country, though of course, it's all geographical and there's nothing surprising about it. Crossing the border (any border) always makes me nervous. It doesn't help that I always feel like I am being interrogated like a criminal by the immigration official. Sure, it would not be beneficial for the officer to act like he's your best friend, but still, I don't want to look nervous and worry about it, you know, even when all my papers are in order. The experience crossing into Canada was actually quite pleasant. But coming into US? Ha! I wasn't expecting it to be pleasant anyways. Both of us had our papers in order and we still had to go into the building to "get updated paperwork", which later turned out to be unnecessary because apparently the person at the counter didn't know enough and was being over-cautious, which is good but ended up wasting a whole hour of our time. We must have driven for 45-48 hours total in two weeks, round-trip. Toronto was 10 hours from home, Quebec City was 10 hours from Toronto, Niagara was 10 hours from QC, and then another 10 hours to home. Plus, plenty of driving in the city. I was very worried about how uncomfortable it was going to be spending such a long time in the car but funnily, it wasn't a problem at all. All I had was a nagging upper back pain (which I get when I'm not in the car as well) that was easily managed by some extra pillows. For as long as we were in Ontario, we saw plenty of English road signs, some of which were supplemented by French signs as well. But once we crossed into Quebec, all English signs disappeared and it was just French signs. Oftentimes, we hoped we were doing the right thing when we couldn't quite understand what a sign meant. When we first crossed into Canada, we were eager to see how things were different on this side of the border. Honestly though, almost everything was the same. Canada, however, uses the metric system, so speed signs were in km/h. We did see some minor quirks that amused us however. In some places, especially in the Toronto area, the red traffic light was huge but the green ones weren't. So we had to often slow down as we approached an intersection to verify what light was ON before proceeding. Toronto must have a lot of faith in its drivers because speed signs were very few in number and very small in size. Being used to US highways, where a speed sign is located every few minutes, this was quite amusing to both of us. Toronto was our first stop and it was similar to most big cities - some skyscrapers, paid parking in downtown, and plenty of stuff to see. Toronto is known for its underground city. So we spent part of our first day there. Of course, it was a Sunday, so most stores were closed, but still, it was better than walking outside. I have seen a similar "underground city" in Arlington, but nothing of this scale. We did hit the Art Spiegelman exhibit at Art Gallery of Ontario, one day before it ended. The exhibit featured several works by Spiegelman, including sketches from Maus - if you've read MetaMaus, you will be familiar with a lot of the artwork. I enjoyed the exhibit a lot - it is always wonderful to see the inspiration and themes of any author, and when it's an author you like, bonus points! We also went to a broadway show while we were there and LOVED it. I had never been to one before, seeing as they are expensive and we were always part of a big group. This time, it worked in our favor and we wanted to give broadway a try. The show we went to was The Heart of Robin Hood - it was funny and the acting was great. We didn't take a single photo while at Toronto. This was mostly because there was still plenty of slush and black snow all along the roads and they certainly didn't add to our visual enjoyment. We were in QC for 3 days and part of the reason we visited this city was to get some European feel while still hopefully being surrounded by locals who knew some English. QC was COOOOOOOLD! We spent one evening driving through the city and thought we could step out for some time and browse through some shops. Our feet and fingers nearly froze off and I landed with a sore throat the next day and a cold a few days later. Of course, it was -25F real feel, so we should not have stepped out. QC downtown was a nightmare to drive through. The road/street signs were small white boards that were mostly hidden against the backdrop. I missed more turns than I could count on a reasonable number of hands. The city was still completely snowed in. A good part of the St. Lawrence river was covered with snow. When we watched from the island we stayed at, we saw a good span of white all over, and then far away, we could see the spires and towers and tall buildings in downtown. 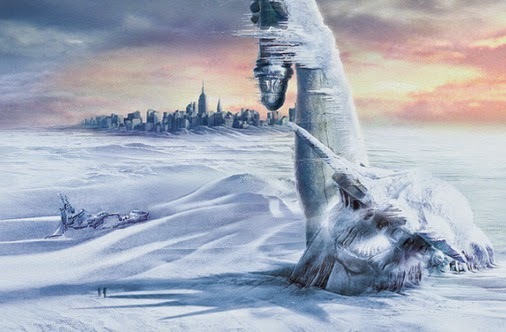 We were strongly reminded of apocalyptic movies like The Day After Tomorrow. On our last day, we went to the Hotel de Glace, which is an ice hotel. This is certainly one of the most amazing man-made creations we have visited. I don't think I would ever book a room at the hotel (which, by the way, you can do!). It was too cold inside, with all that ice and snow carvings. The bedrooms had a bed made of ice and an electric arctic sleeping bag to help you sleep. There was also a chapel where people could get married - a perfect setting for a Frozen fan's wedding! This was the finale of our two-week trip. Honestly though, by the time we hit this city, we were ready to go home. We had just driven about 10 hours to get here. We reached Niagara at night and decided to go see the falls right away. We had already seen the falls from the American side last year, but it was still a beautiful sight - the sheer volume of water falling down day in, day out, non-stop. There were lights projected onto the falls and they were a beautiful touch as well. We returned back in the morning, just before crossing the border to get more daylight shots. After seeing the falls from the Canadian side, it is very hard to return to the US side and feel just as impressed. The Canadian side of the falls has a ton of fun activity, albeit pricey entertainment. It felt like a mini-Vegas. There were casinos, museums, plenty of food places - basically, lots of neon lights. And then you look at the US side and it was mostly dark. The one thing I am always looking forward to when I visit a new place is food! So two weeks in Canada opened up a ton of options for the hungry belly. Since I am pregnant, I was (super) worried about all the eating out I was going to do during two weeks - I was sure my weight gain was going to go off the charts but more than that, I was worried about any excess (sodium, cholesterol, etc) consumption. The hotel room we rented in Toronto had a kitchen so I was glad to have the opportunity to cook if I needed to. And we did have soup once and salad twice so it was not all in waste. Still, eating out for two weeks didn't really turn out to be as bad as I feared it would. Toronto, just like any major city, had a good variety of places to eat at. We didn't eat too often in the city, mainly because of parking worries, but we raided plenty of restaurants in the suburbs. Our favorite place was a grilled chicken restaurant called Nando's. You had to eat their chicken to believe how amazing it was, how much effort and flavor went into it, and just how hard it was to stop eating. We loved this place so much that we ate there twice (the only place we ate at more than once during our trip). There seemed to be plenty of Mediterranean places in Toronto. We did eat at a few of them, (three maybe? ), but we weren't blown away by any of them. They were all good, but nothing magical. There were also plenty of Roti shops in Toronto, where they mainly served Indian flatbreads stuffed with curried meat. We had one and promptly disliked it - I think the problem was just that restaurant though, not the food in general. You had to go to downtown (and struggle to park) if you wanted to eat at the most recommended places in the city. Plus, none of the places were cheap. Food seemed to be priced as if there was a war coming. The husband and I prefer chicken to any other meat. Most French restaurants in QC didn't have many chicken dishes. Most people here seemed to be more comfortable speaking in French than in English. There were certainly many people who did speak English well. But being pregnant, I always ask the waiter more details about the food than I did in the past (is there anything raw or rare in the dish? are the cheeses pasteurized? can you heat the chicken separately before putting it on the sub?) and having a conversation about these questions in such a way that both people (me and the waiter) understood the picture well was sadly, very hard. The husband often had a laughing fit at the end of many of these conversations. The best food we had in QC was at the inn we stayed. The cook, Emily, could whip up even the most delicious omelet. We loved her breakfast so much that we wanted to have dinner there one night and even that meal blew our mind. She has certainly inspired me to want to cook more at home - I just hope the feeling lasts. Her mango salmon was so yummy and Italian wedding soup so appetizing that I was so happy after the meal. The husband had the lamb - something he doesn't usually order or enjoy and he was singing praises of that dish for a long time. Canada, but especially Quebec, is known for its signature poutine - a dish made with french fries and topped with sauce and cheese. Unfortunately, we didn't try this at all, partly because I wasn't too keen on ordering a big plate of fries (you know, there's the baby), and also because, we were initially misinformed that this was a pork dish and I wasn't a fan of pork. Hopefully, I will give this dish a try the next time I am there. The coffee place to hang out at in Canada, at least in Ontario and Quebec, seemed to be Tim Hortons. I had quite a few of their flavored coffees while the husband dug their donuts. Their drinks are very sugary though, so I had to restrain myself from going there too often. Honestly, despite all the snow and the cold, it was a nice kind of winter fun. I had always wanted to visit a "winter wonderland", and I'm glad to report that that desire has been fully realized. I will likely not be doing this again, unless we decide to go ski. For now, it is wonderful to just sit at home, stare at all the sun and green outside and just feel warm. I've never been to Canada so I think your trip sounds amazing! Why doesn't the electric sleeping bag melt the ice bed at that hotel? What a wonderful vacation (despite the cold!). I can't imagine staying at that ice hotel. Brr... That is such a cute picture of you guys. Thank you for sharing your trip adventures. I haven't been to Canada but hopefully will get to go this year! Sounds like you had a wonderful time! I love visiting the Candian side of Niagra Falls. Oddly, I'm reading a book about Toronto right now: Station Eleven by Emily St. John Mandel. I haven't had poutine either, but have a few Canadian blogger friends and that's all they seem to talk about. I guess someday. Oh, love these pics. You look great by the way. I want to go to Toronto again! I don't think I did it right my first time. I do love Niagara. An ice hotel! How crazy! I can't imagine anyone wanting to spend the night there -- looks miserable, even with as many electric blankets as you can pile on top of yourself. But poutine I would have ordered approximately 1000 times while I was in Canada, even if I thought it had pork in it (I officially-but-imperfectly don't eat pork). It sounds amazing. You know, that's a good question. I didn't think of it, so I did some searching and it looks like it is not electric sleeping bag but arctic sleeping bag. I probably misheard that word but arctic makes so much more sense! Still, they did have places where there were tiny lamps behind some ice carvings. I wonder though why those don't melt either. The day we went to the Hotel, it was 32 degrees plus - well above freezing and the Ice hotel didn't look like it was dripping at all. Quite amazing. I hope you get a chance to go there. It was quite fun even though it was terribly cold. It will be nice to be able to go back during the summer sometime. The falls are so beautiful from the other side and so huge! I loved Station Eleven! One of my favorites by Mandel. Hope you are liking it too. I do wish I had poutine, just to know what it tasted like. Maybe next time. We didn't do much either, at least not what most tourists would do, so I don't think we did it right either. Still, it was kind of fun and relaxing. Yes! Our arrival home was a relief! Our dog felt it more than us - she has been avoiding us whenever we tried to get into a car, just in case we dragged her with us as well. LOL! Yes, the hotel certainly didn't feel cozy! The rooms are open - so there is no way to lock yourself in, in case you are like me and go check the locks twice before bed. I do wish we had poutine. I didn't even know it was a dish with fries. I thought it was just pork. By the time we found out differently, we only had two days left and not enough time to eat it since we had a big dinner planned for one of those nights. Oh bummer - next time! Wow - you covered a lot of ground! I can imagine how wonderful it felt to get back to spring though. I've never been to Quebec City, but think I'd like to visit during the summer ;-) Thanks for all the photos, too. Oh, your pictures are just gorgeous! I'd love to stay in the Hotel de Glace, I love winter!! Glad you could go there for me, you and your husband and your dog and your sweet one-to-be. It sounds like you had a great time! The pictures are gorgeous, too. When I think about it, it's kind of amazing the diversity that exists on this planet of ours. I've always wanted to visit an ice hotel. I don't think I'd ever want to stay in one, but I'm so curious. And I get nervous at border crossings, too! This sounds like such a fun trip! I'm with you -- an ice hotel is cool, but I would never want to stay there! And I'm nervous about border crossings. We had a funny experience going into Canada when I was a kid. My dad was acting like such a weirdo (couldn't remember how many kids were in the car!) that we got pulled over and searched by Canadian border patrol. It was ridiculous.